This 55,900-word gay romance novel is the second in a series featuring various members of the fictional Deadly Sins Motorcycle Club. Levi Poe, a.k.a. 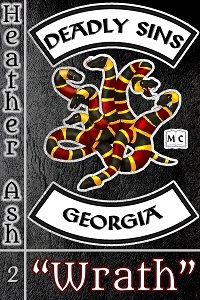 Messiah, is the road captain and son of the president of the Deadly Sins Motorcycle Club charter in Babylon, Georgia. He has everything going for him: loving parents, the respect and admiration of the club’s membership, and privilege brought on by the club’s wealth. By all rights, Levi should be happy, but instead he feels depressed, angry, and trapped. The burden of a secret he’s been carrying around since he was a young teenager is becoming too heavy to bear, and he’s on the verge of buckling under its weight. Levi is gay. When the two youngest Deadly Sins members—Tanner and Mallory—recently came out of the closet together, it should’ve paved the way for Levi to do the same. Despite how diverse and liberal the Deadly Sins Motorcycle Club is as an organization, Levi fears that a high-ranking member of the crew coming out won’t be as well received. Then there is Ryan Floyd, road-name Pretty Boy, a long-term prospect recently patched in as a full member of the MC. As a result of his exceptional performance of duty in procuring new identities for mother-and-son fugitives Justine and Mallory, the club has firmly embraced Pretty Boy as one of their own. But he can’t rest on those laurels alone, so he must continue proving himself worthy of wearing the colors of the seven-headed snake. To further complicate matters, Ryan harbors feelings for the president’s son. Unlike Levi, however, the fact that Ryan is a closeted gay man isn’t the only thing he’s hiding. A “side-job” requiring lethal force will bring Levi and Ryan together, but Ryan’s dark secret could subsequently rip them apart. Will love conquer all, as the saying goes, or will the brutal life that comes with wearing a patch be their undoing?